Welcome to carryonluggage.info the website with loads of reviews about carry-on luggage. Do you need to travel a lot or are you just a sporadic taveler? Are your trips short by or you travel to distant locations? Either way you have come to the right place if you want to know which carry on luggage would be best suitable for your trips. I’m Vince and I’ll be your pilot on your trip in choosing the best carry on bag for your needs. Have any questions? Feel free to send me a message. As an airline pilot I’ve seen or heard it all. 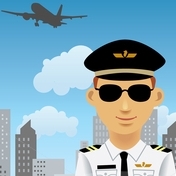 I have more than 20 years of experience in the airline industry as a commercial airline pilot and you won’t believe the things that I have encountered so far. Most departures are nothing special anymore but from time to time certain issues pop up before a plane can take off. People that arrive at the airport but their luggage is not within the airline its guidelines. It’s a last minute problem that creates a stressfull situation. You need to catch your flight, but you can’t take your belongings with you. In stressfull situation people can’t think that well so it’s better to prevent them. For this reason we created this website so that people could travel without hassle. If you’re going to take a plane it’s always best practice to check the airline’s website before departure. It could be they have different rules regarding the size or weight of your luggage and which products you can take with you. Often it also differs when your going on transatlantic flights or just local flights. We hope you enjoy our stay here and if you have any add-ons that would make this site better then let us know!